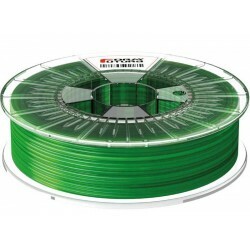 HDglass™ - See Through Green is a vivid high gloss and transparent grass green coloured 3D printer filament. HDglass™ is an impressive and stunning clear 3D printer filament with an unsurpassed transparency. HDglass™ is available in a variety of vivid colours and prints best at a printing temperature range within 215°C and 240°C. Printing with HDglass™ is remarkable easy, as it is a very easy to process material and an excellent first layer adhesion can be obtained by printing at various undergrounds without needing a heated print bed. A good first layer adhesion can be obtained by printing among others on Blue Masking Tape, Kapton tape, or PET tape without having to use a heated print bed. A good first layer adhesion can be obtained on Blue Masking Tape, Kapton Tape, PET Tape.